Shangri-La Hotel, Kuala Lumpur has hampers of two sizes available for sale this year to go along with its traditional Chinese New Year Ninko. The hampers collectively named as the “Luxurious Hampers” will go on sale between 2 January to 27 January 2017. The first set of hampers known as the Prosperity Treasure Hamper is priced at RM1188 nett whilst the other package known as the Deluxe Hamper is priced at RM788 nett. 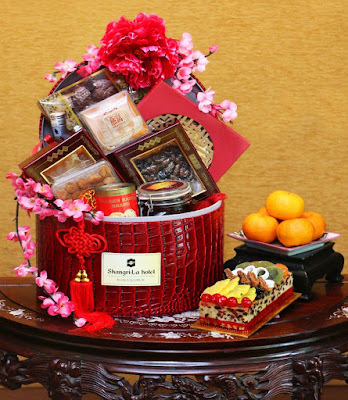 The Prosperity Treasure hamper includes an Eight treasure cake, abalone, dried scallop, bird’s nest, homemade XO sauce, dried mushroom, red dates, Fatt Choy, homemade chocolate praline, pineapple tart, mandarin oranges, Chinese tea, and red wine. As for the Prosperity Deluxe hamper, it is made up of an Eight treasure cake, dried scallop, homemade XO sauce, pineapple tart, homemade chocolate praline, mandarin oranges, Chinese tea, and red wine. Both of these hampers will be available for sale at Lemon Garden 2Go. To order, guests and visitors are invited to contact the café at 03-2074 3546. Another treat not to be missed out from Shangri-La Hotel, Kuala Lumpur is the colourful, fish-shaped coconut Ninko priced at RM68 nett. 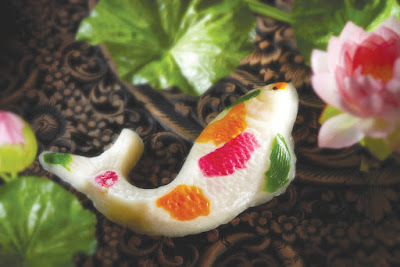 This delicacy is available for RM68 nett as well as two other varieties for RM58 nett each. Those celebrating Chinese New Year are welcome to have a look and order it for takeaway at Shang Palace from 2 to 27 January 2017. For more information on this dessert, guests are invited to contact the Shang Palace at 03- 2074 3904 or email restaurantreservations.slkl@shangri-la.com for Chinese New Year bookings.